Then we drove through Minnesota...where we got caught in an extremely HUGE rainstorm. It was hilarious. When I put gas in my car, I got soaking wet and the wind slammed my car door on my mom's hair and she was stuck. Haha. Then we drove to Durand and Mondovi, Wisconsin. My grandma grew up in Durand and my grandpa grew up in Mondovi. I was so excited to see where they lived! 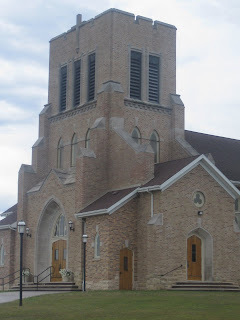 This is the Holy Rosary Church where my grandparents got married on August 20, 1946. It still looks exactly the same. Nothing has changed. I recognized the doors from my grandparents' wedding pictures. It was neat to be there. I also went to the cemetery and saw where my great-grandparents and great-great grandparents were buried. 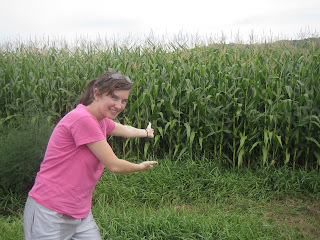 I had to take a picture with corn...it is all there was in Minnesota, Wisconsin, Illinois, and Indiana. Haha. This corn, however, is on my great-aunt's farm in Wisconsin. Then we went to Chicago. It was really cool. This is the Sears Tower. 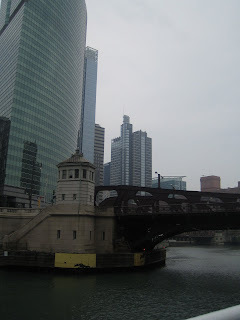 We went on a river architecture tour. 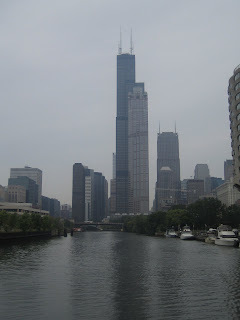 We went on the Chicago River and saw all of Chicago and went under all of the 23 bridges throughout the city. It is a really unique city. Here is one of the bridges...it was cool. My mom and I had a fight in Chicago, however. It was because I got us lost in the south side of Chicago. Not a good idea. I am glad that we didn't die! Indiana was pretty boring. But once I got to Ohio, I was so happy. That's because I got to go to Cedar Point. It is an amusement park that is on Lake Erie. It was so pretty going on rollercoasters with water surrounding you. But, I was so happy because I went on the tallest and fastest rollercoaster in the world. 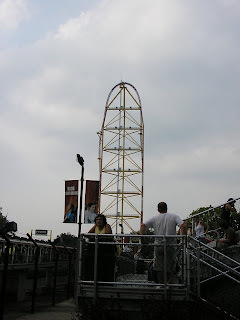 Yes, in 3 seconds you get to 120 mph, then you go straight up 420 feet and straight down 420 feet. It was the most amazing feeling. Doesn't that look like a crazy rollercoaster??? I am in New Jersey!